The above sums up the message delivered by Amir Jamaat-e-Ahmadiyya Nigeria, Dr Mashuud Fashola, at the commissioning of three humanitarian projects sponsored by HF Canada for HF Nigeria. It was yet another success story for Humanity First worldwide in general and Humanity First Nigeria in particular when three humanitarian projects were commissioned within two days at remote locations of Oyo State, south west of Nigeria. 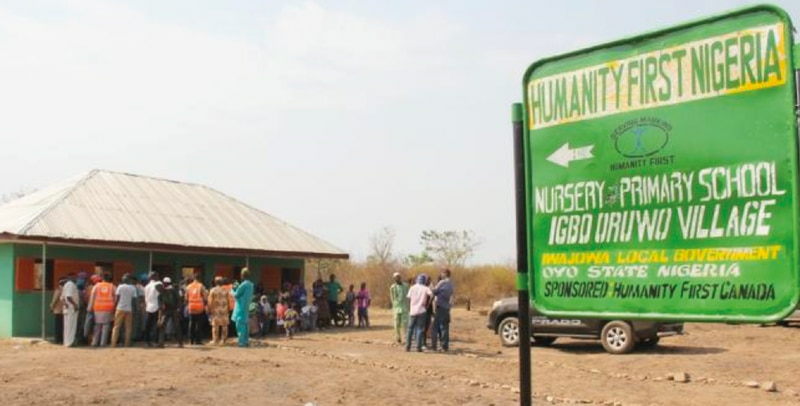 The two projects comprised of the Humanity First Clinic situated at Okooko and Humanity First Nursery and Primary School at Igbo Oruwo and were commissioned on Saturday, 26 January. IAAAE had located solar power energy at Okooko years back. There has not been any government supplied power or energy in the village to this date. The road to the village was dusty and untarred and spanned many kilometres from the main town. It was a joyous day for the people of the village because the clinic was the first of its type. The clinic has a pharmacy, ward, delivery room, injection room, consulting room, toilet facilities among other facilities. Commenting on the event, Alhaj Dapo Yusuf who is the Chairman of the Oyo State Supreme Council for Islamic affairs, thanked Humanity First for such a laudable project in a place where nobody ever thought such a project could ever exist because of its remoteness. He urged people of the village to make good use of the project and to see it as their own. He mentioned how he had always watched the head of the Ahmadiyya Jamaat (Hazrat Amirul Momineenaa) going all over the world commissioning projects and mosques on MTA and that the last thing he expected was that such a project would one day be opened in a village like Okooko. Amir Sahib thanked the Almighty Allah for directing Humanity First to such a place where modern civilisation could not be seen. He described the intention of HF as that of exhibiting the attribute of rahmaniyya (graciousness) of Allah. Speaking during the commissioning, the chairman of HF Nigeria appreciated the donations made by HF Canada as they sponsored the projects. He called on the people of the village to support the staff of the clinic and to secure the facility from vandalism. He assured them that the fee for drugs and other services that would be charged would be minimal and affordable for the peasant farmers and their extended families as the intention was not to make profit but to serve humanity. The chief imam of Ijio, a nearby town, who was invited to witness the event thanked Allah and said that the people of Okooko should now know that Allah had not forgotten them. He commended Humanity First and said that what had been done was the real Jihad of the Holy Prophet Muhammadsa which would touch the lives of the people positively. A volunteer medical doctor and former medical director for all the hospitals in Ogun State, Dr Akindele Nurudeen volunteered to be the pioneer medical doctor of the clinic for the first few weeks before staff would be employed. About 80 people witnessed the commissioning of the clinic. Shortly after commissioning the clinic, Amir Sahib and his entourage were taken through a thick forest and dusty narrow path which led to yet another very remote village called Igbo Oruwo to commission yet another HF Canada-sponsored educational facility – a block of two classrooms. The pupils who numbered about 43 sang choral poems thanking the Almighty Allah and Humanity First for the project. Humanity First donated free uniforms and exercise books. The king of the village appreciated the gesture of the Ahmadiyya Jamaat and wanted more such projects to free the locals from the shackles of deprivation. It was on Sunday, 27 January that Humanity First commissioned yet another humanitarian project at a village called Iye Osa at Iddo Local Government Council of Oyo State. It was about a five-hour drive from the previous day’s location. The local government chairman was represented by the Education Secretary Mr Misbahudeen who met Amir Sahib as the programme ended. The four plots of land on which the school is built was donated by one Alhaj Rasheed Oladepo. Over fifty people attended the Iye Osa gathering.